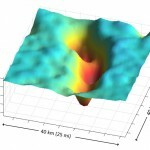 Evidence left by a volcano under the ice sheet suggests that the observed bulging of ice in West Antarctica is a short-term feature that may not affect the glacier’s motion over the long term. 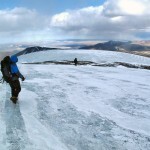 High in Mongolia’s Gobi Desert, the climate is so dry and cold that glaciers shrank during the last ice age. Dating of rock deposits shows how glaciers in this less-studied region can behave very differently as the climate shifts. 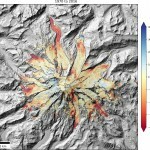 A satellite technique provides a new way to monitor the status of more than 1,200 mountain glaciers in the lower 48 states. A new study provides a postmortem on the Yukon’s Slims River, whose flow was diverted in early 2016. It is the only documented case of “river piracy” in modern times. 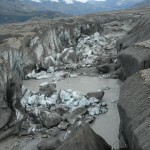 Drainage of four interconnected lakes below Thwaites Glacier in late 2013 caused only a 10 percent increase in the glacier’s speed. 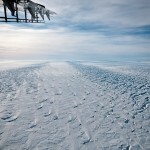 The glacier’s recent speedup is therefore not due to changes in meltwater flow along its underside. 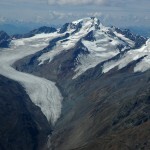 A University of Washington study addresses controversies over the cause of mountain glacier retreat, and finds that for most glaciers the observed retreat is more than 99 percent likely due to climate change. 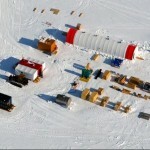 UW glaciologists helped drill the first deep ice core at the South Pole, which will provide new clues to Antarctica’s climate history. 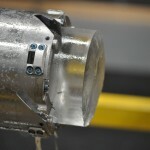 UW glaciologists were part of a team that used a new Antarctic ice core to discover which region triggered sudden global-scale climate shifts during the last ice age. 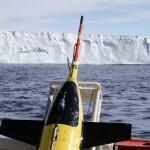 The collapse of the West Antarctic Ice Sheet has begun, according to computer models using detailed topographic maps. 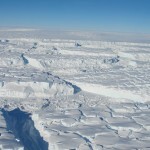 The fast-moving Thwaites Glacier will likely disappear in a matter of centuries, researchers say, raising sea level by nearly 2 feet. 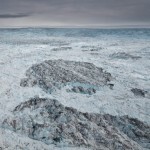 Observations of Jakobshavn Glacier from 2012 and 2013 show the fast-moving glacier has set new records for the speed of ice flowing toward the ocean. A new study in Science, co-authored by the British Antarctic Survey and UW authors, shows that melting of the floating Pine Island ice shelf is tied to global atmospheric patterns associated with El Niño. 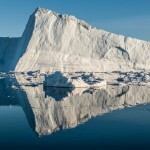 Changes in the speed that ice travels in more than 200 outlet glaciers indicates that Greenland’s contribution to rising sea level in the 21st century might be significantly less than the upper limits some scientists thought possible, a new study shows. 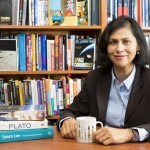 In a pair of companion papers in Science Express this week, scientists investigate the role of surface meltwater on accelerating the flow of the Greenland Ice Sheet and outlet glaciers and conclude that, while surface melt plays a substantial role in ice sheet dynamics, it may not produce large instabilities. 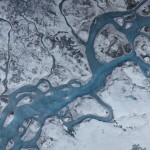 Two of Greenland’s largest glaciers shrank dramatically and dumped twice as much ice into the sea during a period of less than a year between 2004 and 2005. With warming temperatures as the possible underlying cause, scientists wonder what is pushing Greenland’s glaciers out to sea as much as 50 percent quicker than before. The world’s fastest glacier, Greenland’s Jakobshavn Isbrae, doubled its speed between 1997 and 2003.